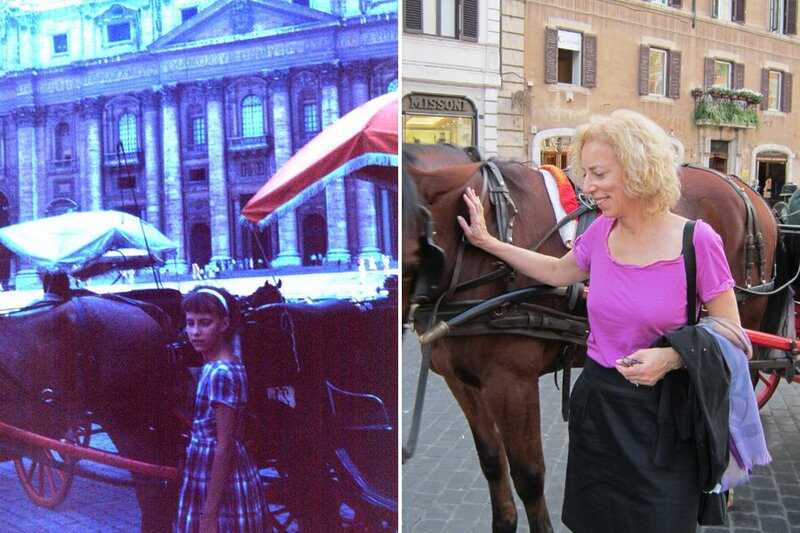 The author in Rome as a child and recently. Who says you can never go back? All photos by Becky Sue Epstein. ROME – Rome, Paris, London: Dream destinations for every traveler. But not for me. Having traveled through Europe as a child, I always put those cities in the been-there-done-that category. Now that my work takes me to Europe several times a year, I often find myself changing planes in these cities, but never stopping. Eiffel Tower? Went up when I was seven. Tower of London? Check. Coliseum? Of course. But wait: What do I really remember? Recently, I decided that maybe my child-size marvels of Rome weren't enough for a lifetime and that maybe I had been missing out. Could I recapture the wonder of discovery in cities I thought I already knew? The next time my itinerary showed a plane change in Rome, I jumped at the chance. I reached an old family friend who invited me to stay for a few days. I landed to a warmer-than-usual late October. Definitely outdoor café weather. Day one, we sat at our table waiting for lunch, because of course you have to eat well before you start anything in Italy. Suddenly, I saw the familiar Fanta orange soda in my hand. Yes, this was the Rome of my memories. 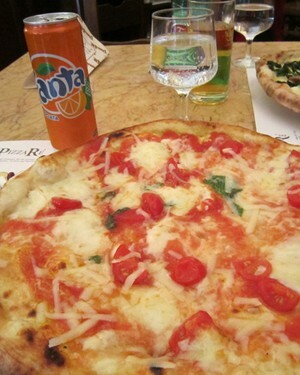 As a kid, Fanta accompanied all my meals: Spaghetti with orange soda was my preferred comfort-food pairing. But the moment didn't last. We were having pizza — admittedly perfect pizza — not spaghetti. After lunch, I window shopped my way to the Spanish Steps. Which were a mob scene. Hundreds of tourists speaking English, French, German, Japanese and other languages milled around in bright T-shirts. Gawking sightseers covered the square, lined the edge of the fountain, and obscured the famous Steps. Everyone was holding a cone of melting gelato. I had set myself an ambitious schedule of re-visiting Rome's main tourist spots, but, surrounded by buzzing hives of tourists, I could feel my energy drain away as I aimlessly wandered the nearby streets. How could I appreciate Rome when it was awash in international sightseers? When my friend came to pick me up at the end of the day, he was astonished at how little of my plan I had accomplished. I couldn't really explain it. Maybe I didn't want him to know how disappointed I was in Rome. Day two: After lunch (of course), I set out for the impressive Piazza Navona on foot. It was impressive all right: densely crawling with tourists. Filled with even more tour groups than I'd seen yesterday, each guide holding up a stick with a different colored mop-top as she threaded her group through the throngs. In the middle of the piazza was what looked like a craft fair: dozens of "artists" with dubious wares set out on easels and stands making a play for tourist dollars, euros, yen. Later, my friend would be astonished that I hadn't appreciated the Bernini fountain in the middle of the Piazza. Appreciated it? I hadn't even noticed it. 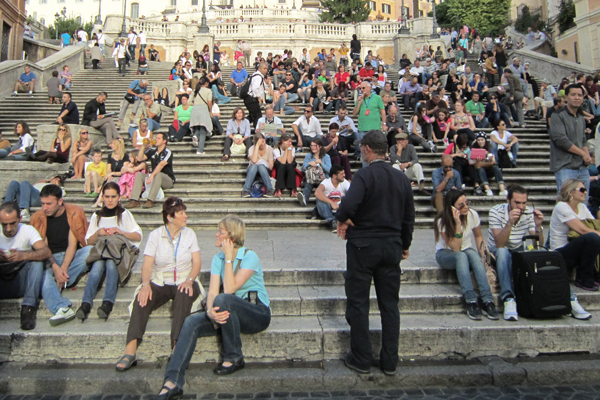 If you look hard enough, you can see the Spanish Steps hidden underneath all those tourists. Touristy shlock. When it's bad, it's horrible. Exiting the Piazza, I continued on the sign-posted tourist route lined with souvenir shops. 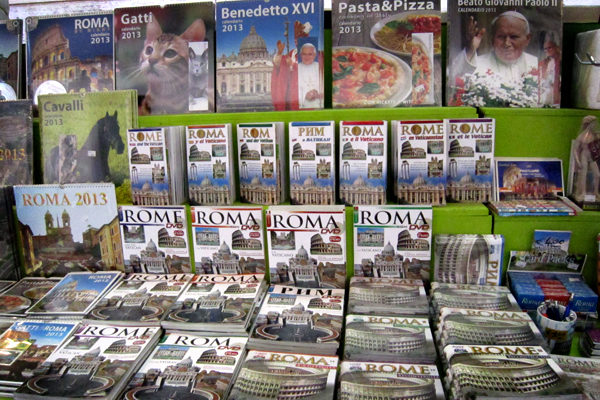 This year's souvenir calendars featured Italian food, the pope, or Roman cats. The cats were one of my strongest childhood memories of the Coliseum, when it was the headquarters for swarms of feral cats. Those cats had enchanted Roman ruins for me. Meanwhile, I staggered along the cobblestones with the streams of tourists. Until I rounded a corner and it hit me: the Trevi Fountain. Rising from a clean, blue pool into white marble statues that soared overhead, taking my breath away. At that moment, the tourists had thinned, so I could easily make my way down to the edge to feel the fountain's majesty. How improbable: I had thought the fountain would hit me as the cliché of all clichés, with scenes from Roman Holiday and the refrain from "Three Coins in a Fountain" running through my head. Instead I stood and stared, wondering at this glorious, allegorical sculpture that has awed people for some 350 years. 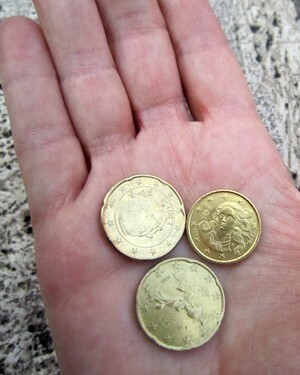 Shaking out my purse, I found I had exactly three coins left. Without thinking, I threw them as far as I could into the fountain. Then I trudged on to the last stop in my plan. When I arrived at the Coliseum, it was nearly 5:30 p.m., closing time. No question, I walked right in. Yes, tourists. Yes, ruins. But I had set myself a goal. The Coliseum sits on one of Rome's busiest roadways, with cars flying by day and night. But inside, it was quiet, a serene, half moon rising above the ruined walls as the day waned. I found myself walking as quickly as I could, eyes raking the ruins below, darting glances around every corner, not really thinking about the Coliseum at all, planning my route to a birthday dinner I was invited to that evening. Sightseers wandered in groups, families, couples. I was alone. I had been so excited to see the Coliseum that I had relished as a child, and now I had no one to share it with. The stairs were steep, the stones uneven underfoot. There's talk of an extensive renovation. Italians always talk. As the dusk threatened, so did my thoughts. Would this be my last time? Would I ever connect with the earlier me, a version of myself thrilled to be in Rome? Suddenly, a sleek, well fed, black cat appeared before me, weaving through the tourists. It jumped up on a nearby column and posed. Amazing. 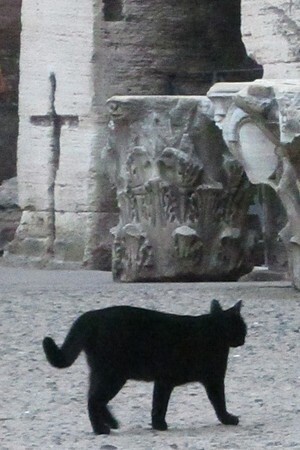 A Roman deity had sent me exactly what I had been looking for all over the Coliseum: a cat. But not the scrawny, wild version I had remembered. This cat was obviously a house cat at the Coliseum, cared for by the staff. Its fur was glossy, its body healthy, and it was definitely used to having people around. Soon I began to notice the other things around me: the detail of the column capital the cat was sitting on, the construction of the walls and floor nearby, the arches all around. I thanked the cat — and the deity — for the experience, the moment, the connection. I was myself again. I was, like the other tourists, lucky to be in Rome. Becky Sue writes about wine and spirits. In between visiting international vineyards, she writes books and practices her Champagne sabering. She travels for the wine — and everything that goes along with it.